Burlington College is one of only a handful of higher education institutions offering a Cuba Semester Abroad experience for each Spring Semester. From 2007 until present, the College provided dozens of students with the opportunity to study abroad at the University of Havana, Cuba. Zac Young is a majoring in Political Science and currently in the middle of a semester in Cuba. This blog post is his reflection on the experience so far. Cuba is a country of contradictions, and getting to be here, to glimpse how it actually works, is an incredible experience, especially now with the historic political changes taking place. Burlington College gave me the chance every poli sci student dreams of: to not just study history, but to live it. I received a unique new perspective just from being here, but the Cuba Semester Abroad program also allowed me to meet the U.S. Ambassador in Cuba and hear firsthand about the diplomatic changes underway. 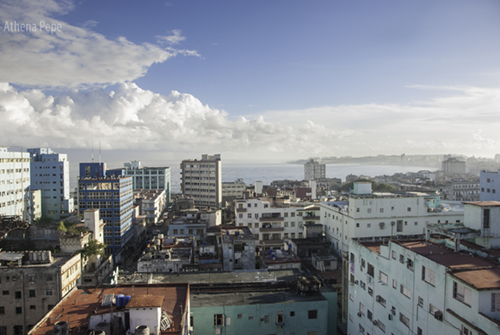 Even just the chance to live in Havana is eye-opening, as it truly is a a city of living history. The houses have remained unchanged since the 1920’s, the cars are the same ones (literally) that were on the street 50 years ago, and even the newest apartment buildings are from the 60’s. The Burlington College program gives students an unparalleled opportunity to immerse themselves in one of the world’s most unique cities and cultures, and I feel lucky to have found it. Because of Burlington College’s long history in Cuba and its close relations with many of Cuba’s most interesting institutions and organizations, I as a student have been offered a mountain of incredible opportunities, from a film class at a foundation started by Gabriel Garcia Marquez to conversations about the changes Cuba is facing at the Jose Marti Institute. These truly give a peek beneath the surface of Cuban life into the depth of culture and knowledge Havana is famous for, and that is something only this Burlington College program can offer. There is no better way to improve your language skills than immersion. Being here, listening to Spanish every minute of every day, speaking it to navigate everything from my classes to my daily necessities, has pushed me to improve faster than I thought possible. Not just speaking, but living Spanish, has helped me cultivate a real comfort with the language that a classroom alone could never match.